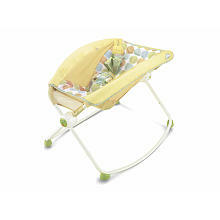 With Little Man there were a few things that we couldn’t live without…our baby swing was one of them. It was the only way I could get him to sleep longer than 45 min. for a long time. 1) Bassinet: A friend of mine lent me this sleeping apparatus after Baby Boy spent the first 2 weeks sleeping in his car seat. He seemed to prefer to be at an incline instead of flat on his back or sitting directly up in the swing. In fact he couldn’t care less about his baby swing, really. This thing has been SO great. Its light so it is easy to bring up and down stairs and from room to room, which we do all day long. Baby Boy sleeps great in it! I think its because it kind of cups him, making him feel like he’s being held. 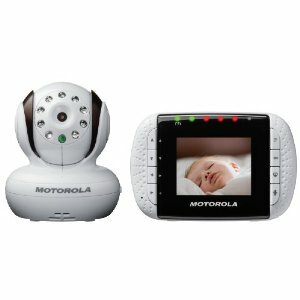 2) Video Monitor: We now have the Motorola 2.8 inch Digital Baby Monitor and it is SO wonderful! We first bought this one and it was horrible, cheaply made, and broke within 2 weeks. For someone as frugal as me, you can imagine this was incredibly frustrating. We returned it and did more research and decided on the Motorola one and couldn’t be happier. With Little Man, I always found myself wishing I had a video monitor. I would want to check on him while he was sleeping in his crib, but didn’t want to open the door and either wake him, or let him see me. So we decided with our second to make the investment. We even bought an extra camera so Little Man has one in his room too. The monitor has a talk back feature on it so when I see Little Man NOT going to sleep, pulling the window curtain over his head, picking his nose, etc…I can talk to him with the monitor base and tell him to stop. Ha! The first time it really flipped him out even though we had talked about how I would be able to talk to him from downstairs. Hubby and I got a very good laugh out of Little Man’s reaction. 3) Super Amazing Swaddling Technique: LIFE CHANGING ladies…this is life changing…click on the link and watch the video! I know every baby thinks they don’t like to be swaddled, but unfortunately, they don’t know what is best for them 🙂 (And best for mom, because with this way of swaddling, they literally can not bust their little flailing arms out and they sleep SOOO much better.) Baby boy immediately calms and falls to sleep when wrapped up this way. We do it just a little different. I cut a flannel swaddling blanket into 3 large triangles and use them for the “bat wings’ part, laying the triangle inside another swaddling blanket ready to be wrapped around him. If I use a whole blanket folded in half as a triangle and then another to wrap around him he gets too warm. I use the Aden and Anais swaddling blankets to wrap around the outside and they are perfect! Those are our top baby things right now. Do you have a few favorites of your own? Id love to hear. Ahhhhh!!!! That is what I felt like shouting when I saw the Fisher-Price Rocker! Why oh why did I not know of this with Noelle? This would have been JUST what we needed for our refluxy baby!! The incline, how closed it is… why did we spend all that time trying to incline our silly pack n play bassinet?? All that to say: we are rushing to Wal-Mart to purchase that for Cate! Thanks SO much for the tip! And we love that swaddle technique, too — that’s basically the Miracle Blanket DIY!